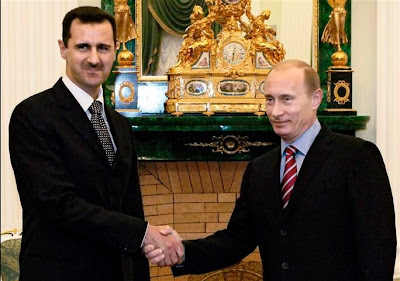 Middle East Perspectives by Rick Francona: Syria: What does Bashar al-Asad get for giving up his chemical weapons? Syria: What does Bashar al-Asad get for giving up his chemical weapons? Part of the deal between the Russians and the Syrians that led to the Syrians admitting that they possess chemical weapons and have committed to relinquishing them is believed to be Russian agreement to reinstate the halted deliveries of two military aircraft contracts with the Syrian Air Force. Prior to the outbreak of the civil war, the Syrians contracted for a replacement trainer aircraft for their aging fleet of 1980s-era Czech-built L-39 trainers. The L-39 was used in the initial months of the civil war by the Syrians as a light attack aircraft - it is equipped with a gun pack and hardpoints on the wings to carry bombs and rocket launchers. The L-39's have largely been marginalized because of increasing shoulder-launched air defense capabilities of the opposition forces (some seized from Syrian army depots and some provided by foreign countries), and the fact that most of the L-39 operating bases have been overrun or are under siege by the rebels. The aircraft purchased - but not yet delivered - to replace the L-39 is the Yak-130 (NATO: Mitten), built with involvement of the Italian aircraft manufacturer Alenia. The Syrians have contracted for an initial lot of 36 of the aircraft. The Yak-130 can carry an external load of three tons (bombs, missiles, cannon pod, or fuel tanks). In addition to the Yak-130, the Syrians have ordered between 10 and 24 MiG-29M2 (NATO: Fulcrum E), the newest version of the 1980's-era (fourth generation) fighter aircraft. Unlike the estimated 48 MiG-29 (NATO: Fulcrum) air-to-air fighters currently in service with the Syrian Air Force, the newer version is a multirole aircraft that adds a significant air-to-ground capability, including precision guided munitions (PGM). The two aircraft represent a generational advance for the Syrian Air Force, giving them a heretofore nonexistent capability to deliver precision guided munitions. When equipped with PGM (either laser of GPS guided), the aircraft will be able to remain outside the threat envelope of the shoulder-fired air defense missiles available to the opposition forces, while being able to place weapons accurately on specific targets rather than dropping them near suspected rebel locations or indiscriminately on civilian populated areas. In the absence of a no-fly zone, the addition of the capability to deliver PGMs will be a quantum leap in the effectiveness of the Syrian Air Force against the opposition. While these are not state-of-the-art fighters in the Western sense, they can he highly effective in the Syrian battlespace.